De Haske publishing house is releasing new editions of Jon Lord’s Concerto for Group and Orchestra and Sarabande. This premiere publication of Jon Lord’s Concerto for Group and Orchestra is a major event, and one that might never have happened. Lord composed the work during early 1969, shortly after founding the band that made him famous, Deep Purple. Always equally passionate about orchestral music, he was determined to create a vehicle by which the two worlds could be joined, and it was written quickly – often nocturnally – between gigs with the band. Following a US premiere at the Hollywood Bowl in 1970, the original score and parts mysteriously disappeared and have never been recovered. The entire work was therefore thought to be lost until 1998, when a young Dutch composer by the name of Marco de Goeij transcribed the musical text from the 1969 live recording. This immense, not to mention entirely improbable labour of love finally opened the way for the music to be heard again. Lord then spent several months working with the conductor Paul Mann, building on de Goeij’s transcription, painstakingly reconstructing the work in preparation for a weekend of performances on the 30th anniversary of its original premiere, again at the Albert Hall with Deep Purple, this time with Mann conducting the London Symphony Orchestra. The Concerto was subsequently the centrepiece of a world tour with Deep Purple during 2000-1, and then became a standard feature of Lord’s live appearances with various groups and orchestras, independently of the band for which it was originally written. The first-ever studio version of the Concerto, with Paul Mann conducting the Royal Liverpool Philharmonic, and a hand-picked cast of rock luminaries, including the composer himself, was released in 2012. It was to be Jon Lord’s last performance on disc. De Haske’s newly published full score sees this seminal work in print for the first time ever. It is painstakingly edited by Paul Mann, whose long-time musical association with Jon Lord and extensive experience of performing the music, ensures that the text reflects the composer’s intentions as faithfully as possible. 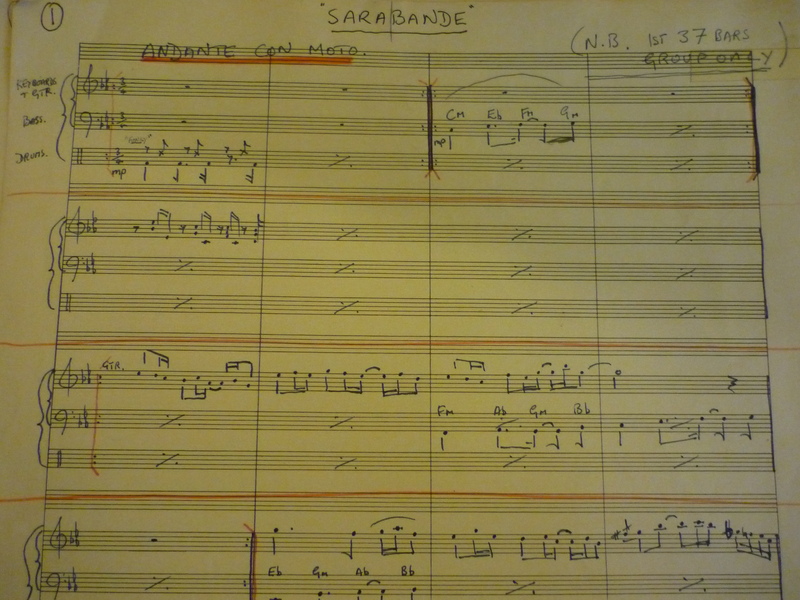 The Concerto appears together with another of Jon Lord’s highly successful blending of the rock and classical worlds, Sarabande. First released as a solo album in 1976, recorded with the Philharmonia Hungarica directed by Eberhard Schoener, and at that stage only partly orchestrated, Lord returned to the work in 2010 with the intention of creating a companion work to the Concerto for himself to perform live. His new orchestration is a virtuoso workout for both band and orchestra. The new score again marks the music’s first appearance in print in any form, edited by Paul Mann in conjunction with every available source, including the manuscript material surviving from the original 1975 recordings. It also incorporates many changes made in collaboration with the composer following the work’s premiere in Budapest in 2010. Jon Lord was a unique figure, as much at home in the ‘classical’ world as he was in his role as one of rock music’s great pioneering keyboard players. His intention in creating these works was ‘to make music in the place where the best of both worlds meet’, and it is hoped that in making these works available in print for the first time, performers and music-lovers everywhere will be able to do just that. See our Web Shop for other works by Jon Lord in print. Jon Lord is and will always be my favorite musician. As a young child studying the piano and also becoming interested in rock, he showed that it is possible to have both, that one need not choose one over the other. Upon hearing the Concerto in 1970 (I was 11), I was blown away. Within a few years, I was also playing keyboards in rock bands and utilizing my classical training incorporating it into the music (especially Bach). Without Jon Lord showing this to be possible, I would never have done this. He is my hero, and he is greatly missed. Thanks to send me news about Jon! His music is ever into my brain and into my heart! I have listened to this music again and again while preparing my graduation (passed it anyway :-)) Thanks Jon! Are the scores already available? I could`n find them on De Haske. It seems that De Haske is still in the process of updating their database. As soon as I know for sure the actual publication date I will post it here, but this will be very soon. We will publish full info, including price details etc as soon as we have them. Touché. Thank you. For Marco, every credit is well deserved. He is naturally very prominently credited in the front of the new score. We will have now thousands of classical orchestras playing this work…. at last.